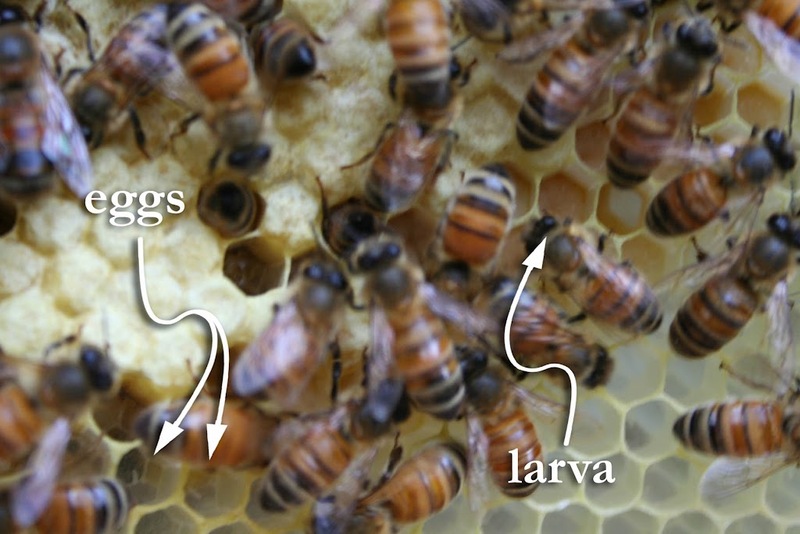 I have been worried because, although the bees have been building beautiful white comb since they moved in on May 20th, we have never spotted the queen, and I have never been able to identify clear evidence that she's there and laying eggs. 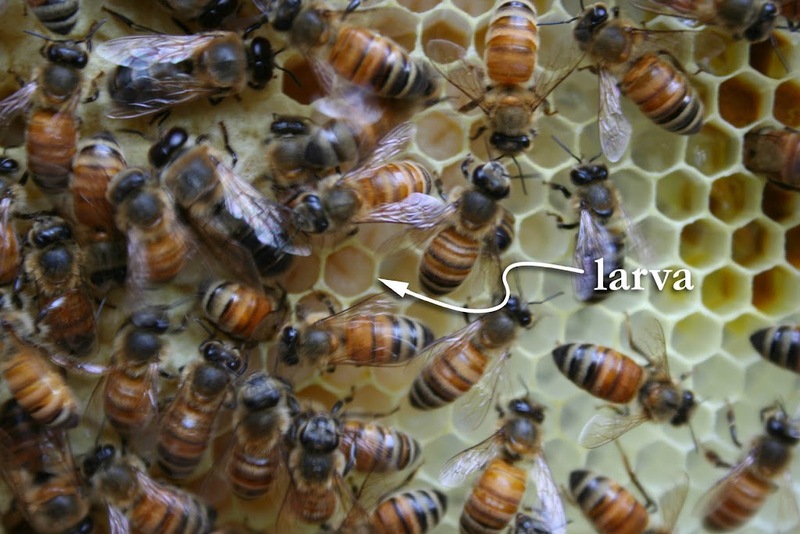 Without a laying queen, the colony would die off in several weeks, since each bee only lives one to four months. Last time we checked the hive, a week ago, we only saw stores of pollen, nectar, and white-capped honey, near the tops of the frames. But Allen and I checked the bees this morning, and saw two different colors of capped comb - white near the tops of the frames, and tan near the bottoms - which means that the white is probably honey that they've capped for storage, and the tan is probably brood (larvae) that they've capped so it can develop. But we still weren't totally sure. But finally! We spotted cells with larvae in them - they look like little white shrimp curled up at the back of the cell. And looking at the pictures now, rice-shaped eggs are visible in other cells. Yay! Things are going fine, of course. The bees know what they're doing. It's all mixed comb so far - each frame has brood comb, honey comb, and stores of pollen (the dark yellow) and nectar (some of the clear liquid). 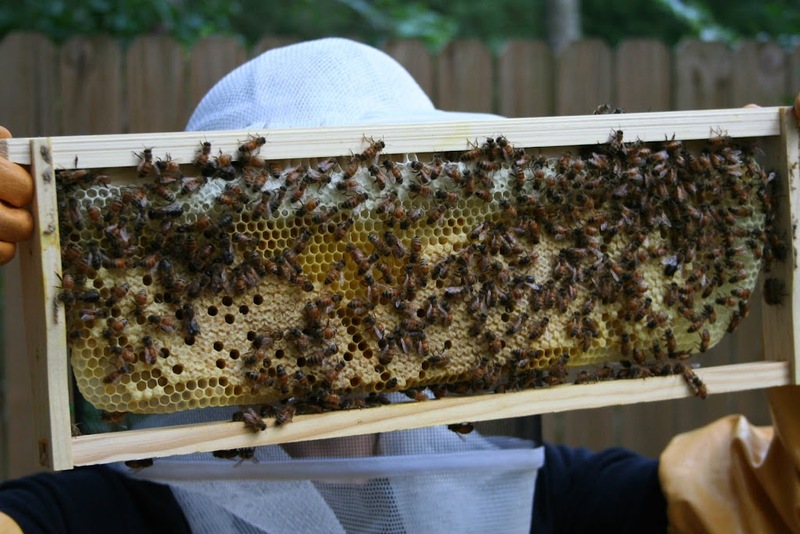 Nearly all the frames in the bottom box are full of comb, so now we're encouraging them to move up into the second box and build comb there, as well. We removed two empty frames from the top box and switched them with two full frames from the bottom box. Hopefully they'll start building up there and using some of the frames to store honey. I don't plan on really harvesting honey this year, as the bees will need most of it for their first winter, but I'd love to taste just a little. Great job, bees! Thanks, thirty-four million years of evolution! Queens are often hard to find but you have evidence there that she's there somewhere and laying a good pattern of brood. Very exciting isn't it? I don't like when they glue the frames down so it's hard to pull them up for a look.